She has traveled the world, had life experiences which would spark envy in the heart of many; she is a talented artist, experienced teacher and best of all – she is a strong, independent and courageous woman. And yet, she wears a graceful beauty – inside and out. Her humble and gentle spirit exudes a pleasant warmth, without a single hint of arrogance. She is Barbara Schlegel. Glen Ilah is home to Barbara and her equally talented hubby of 10 years, Wayne, who is a retired Electrical Engineer. The couple met through a mutual friend, who engineered a dinner so they could get to know each other. The rest is history! Their home is cozy, and filled with history, as well as the added touches that make it uniquely their own. Wayne purchased the house a decade prior to meeting Barbara. He performed several home improvement projects effortlessly, including electrical work, plumbing, and hand-crafted, stained glass light fixtures. The Schlegel’s have an ongoing project as well: a beautiful new bathroom, which will be complete with a jacuzzi bathtub in the near future. 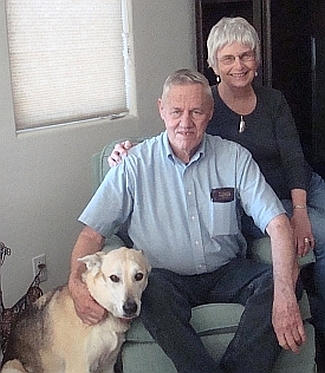 The Glen Ilah home is not their only residence, as they have a home in Surprise, AZ, which they visit almost weekly, enjoying a shopping trip while they stay there. I was quickly introduced to Ginger and Ash-Lee, the family pets. Ginger, a German Shepherd mix sports a beautiful off-white, tan and grey coat. Barbara pointed out that of course, Ginger was sure I was there to visit HER. Ash-Lee is a cat that was accidentally inherited after the Yarnell Hill Fire. She came to the Schlegel’s needing food, and was down to skin and bones. Barbara has fully nurtured kitty back to health, and she is now part of their family. As is the case with many homes in Glen Ilah, the 2013 fire claimed some of their property. Wayne and Barbara lost outbuildings, which included a garage Wayne built himself, a shed and, sadly, her art studio. She also lost her car, and Wayne lost a a tractor that he had restored. Many precious memories went up in smoke, such as 18 of Barb’s paintings, souvenirs and gifts from her former students – priceless items, for which no amount of money could bring restoration. But, the couple is grateful that the main dwelling structure was untouched, and grateful they were able to move themselves to safety. Barbara was born and raised in Ontario, Canada, and resided their until 1967. She became intimately knowledgeable in the field of early childhood education since the very home she grew up in was a pre-school, operated by her mother. In 1958, Barbara became a certified teacher in Canada. She married, and due to her then husband’s career, they moved to the U.S. The standards in Canada required a teaching certificate, but the United States required a teaching degree. She was eventually able to attain not only a B.S. but a Masters of Education degree from Arizona State University. Her total teaching experience took place in 5 states and 3 countries (U.S., Canada and Saudi Arabia). Teaching was very rewarding for her, and still provides a great sense of fulfillment in Barb’s life. She recounted a wonderful story during our interview, that took place while she still resided in Canada. A position became available at a Pre-School Co-op, for which she applied. The prospective employer wanted to know what she planned to do if hired. So, being the independent thinker that she is, Barb visited several different pre-schools, and wrote down all the positives and negatives of each school. Armed with that valuable information, she formulated her own plan for the Pre-School Co-Op. You guessed it, she was hired! In face, the school adopted and implemented Barbara’s innovative plan. The reward continues for her. That same pre-school recently celebrated 51 years strong. Barb attended the celebration, and her plan is still being followed. Barb had the privilege of living in Saudi Arabia with her children for a time, where she also was a teacher of Kindergarten and 1st grade at the American Consulate. Her first husband taught at the University there, and a perk of his position was paid travel. The University sent the family home every 2 years; they were also given an “around the world ticket” so they were able to visit several countries, including Iran, and Taiwan. They also visited the state of Hawaii. Travel was exciting for her and her 2 sons. She speaks very highly and with motherly love about her sons. One of them resides in Mesa, the other resides in Seattle. She has 2 lovely daughters-in-law, and boasts 8 grandchildren, 5 great-grandchildren, and one great-grandchild on the way – due December 12th. She fondly says her 3rd child was the Pre-School Co-op in Canada. As much as Barb loves teaching children, she took her career to a different level when she wrote college papers on the subject of Gerontology, and became certified on that subject. While teaching at a private school in Phoenix, she became involved in “Inter-Generational Programming”. This involved Barbara taking her 5 and 6 year-old students to a Geriatric center, and teaching them how to relate to the older generation. She explained that it was quite successful. The experience was heart warming, especially seeing her 5 year-olds coloring pictures and talking to the Geriatric patients so innocently. It was good for all involved parties. Barb related a story from her early teaching days. She was concerned about discipline in the classroom. She wanted to be a nurturing teacher, not the teacher “police”. This prompted her to improve her skills further by taking a course in positive discipline. From that experience came the birth of “Huggy Bear”, the new classroom disciplinarian. Barb explains that since teachers were not permitted to hug a child, she used a stuffed hand puppet that would give the hugs for her at the end of each day. The children would write letters to Huggy Bear, and Huggy Bear would promptly respond. This was an exercise for the young children in reading and writing. It was also a homework assignment for the teacher, responding to all the inquiries. The children came to respect Huggy Bear, and did not want to upset him, so the positive discipline was in force and working! This fabulous teacher, who always found a way to think outside the box, has even had the opportunity to teach John McCain’s grandson as well as Sandra Day O’Connor’s grandchild at a wonderful private school in Phoenix. And all the while she painted her lovely artwork, mostly as a hobby, generously giving her work to family members and dear friends as Christmas gifts. She was once scolded by a teacher for her art. The teacher told her it was no good, which of course caused her to stop her painting for a time. But she enjoyed it, and decided it was HER hobby, and no one would prevent her. Therefore, the talented acrylic and water-color painter just continued to perfect her craft. 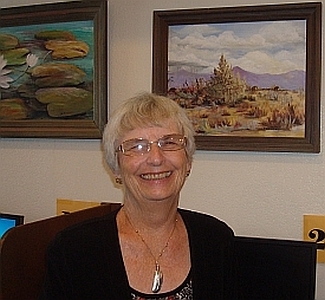 Yarnell Hill Fire inspired her to paint a mini-series called “Glen Ilah Rising”, which so magnificently depicts the ashen boulders, with the amazing new growth around them – flowers, greenery, and post-fire natural beauty. 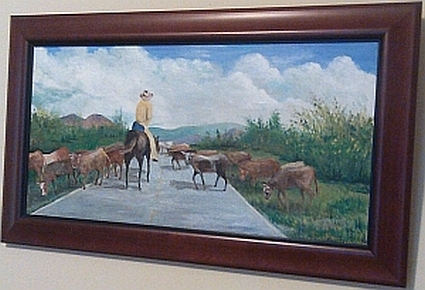 Barbara paints mostly with acrylics, but has some spectacular water-color paintings, all of which are in glass frames. She explained to me that water-color painting is more difficult, because a mistake is permanent. When using acrylics, a mistake can be painted over once dry. Water color paintings are more fragile to exterior conditions and must be protected, which is why they are in glass frames. Barb enjoys the Yarnell Artist Group that she and a friend started. She regards the time they spend together on Thursday mornings as the highlight of her week. They meet at a local resident’s home, who has room enough for a large table, and several local artists gather to paint and share their talented pieces with each other. (Bill Chaplin is one artist who attends this weekly solace.) 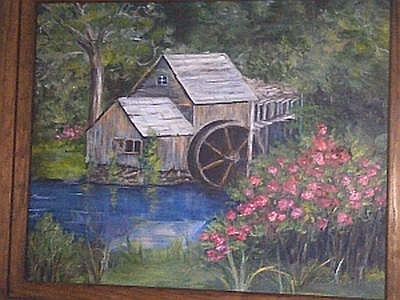 Barb’s scenic paintings are extremely detailed, and her use of color is amazing. One piece in particular captivated me, reminding me of the local Zoo in the town I was raised: a beautiful depiction of an old farm building behind a large Water-Wheel – a truly gorgeous painting. 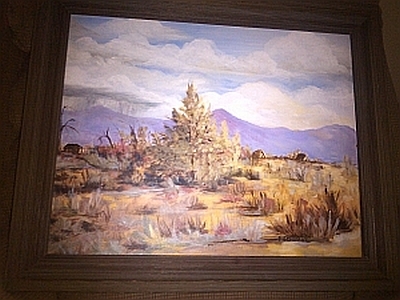 Barb’s work was recently displayed in the Yarnell Public Library, when she was the featured artist of the month. If you are interested in information regarding her work, purchasing a piece or a print of Barb’s paintings, you may send her an email. A truly wonderful community is only as good as its members. I have had a fantastic year in Yarnell. The people I have met have inspired me; the strong community spirit, the social bonding that has taken place due to the recent tragic fire and the further cementing of relationships as we rebuild have amazed me. Meeting and becoming friends with Barbara Schlegel has also inspired me, but in an individual manner. Barb is a person that all young ladies should meet, to witness the character of an upstanding and strong willed “go-getter”, who lives life to the fullest and enjoys her dreams, and who marches to her own drummer. She profoundly shared this with me: “I am a person who believes that if you put it out there, it will come back to you.” Thank you, Barb, for your positive energy, the legacy you have left your students, and the legacy you are creating for all of us in the community. Glen Ilah/Yarnell are lucky you are here! 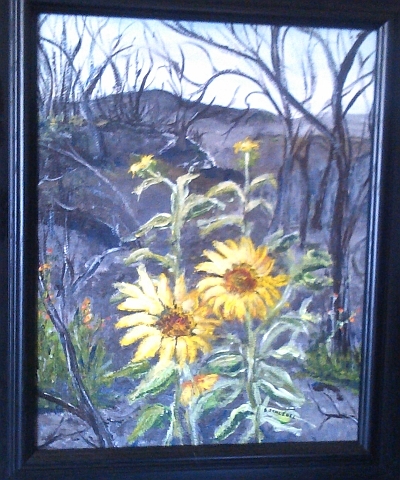 Barb, I have received many wonderful comments regarding the sunflower paintings……….love them. Thank you for the lovely comments, Leah and Jerry. I too love this town and the unique people that make up this great place to live. Thanks Denise for your friendship. I enjoy our “coffee breaks” and hope we can do more. My beautiful silver earrings that Lou made are so light and comfortable. I love them and will tell everyone about the talented maker. Thanks again!! Barb, you are so very talented AND a wonderful person too. Is it possible to find a better place to live than Yarnell? Seriously, this little town is filled with such talented and wonderful people. I can’t see myself anywhere else. Very nice article Denise, thanks for featuring Barb. I so enjoyed the time I spent with Barb, and since then, we’ve gotten together for coffee. She’s an amazing lady, with an interesting story! She always has another great life story to tell. Thanks, Leah! Wonderful pics and story about Barb. She is a dear friend of mine and I think you really captured her essence. Thanks Denise. The photos are very good of Barb’s work and I am happy to see that. She is very unassuming and kind. Thanks for listening to her!